FLEXMAIL 02-2018 - Hose crimpers, hydraulic crimpers, Workshop crimpers, Production crimpers : UNIFLEX of America LLC. Ideal for hoses used in the food and pharmaceutical sector as well as, for instance, for the production of fire hoses: With the new SL 3-75 lubrication-free hydraulic crimper for the robust machine crimping of fittings, couplings, etc. at high-performance hoses, UNIFLEX again satisfies the most important practical requirements of the industry – optimum quality and highest economic efficiency due to a device that is long-living, has a wide range of applications and is ergonomic. The crimp force of the SL 3-75 is 50 tons (500 KN). The opening path of the crimping dies is more than 55 mm, and the maximum crimping diameter is 88 mm. 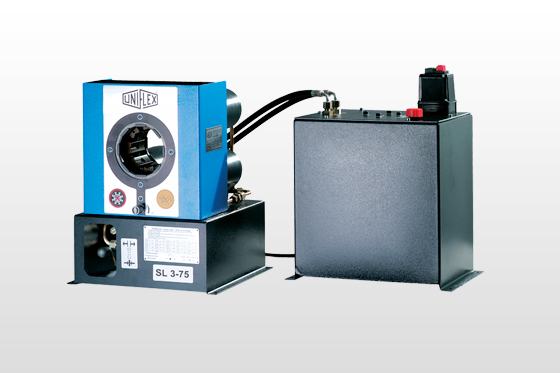 The design of the SL 3-75 is based on a proven concept – that of the UNIFLEX HM 200 hose crimper. This unrivalled classic among the workshop crimpers in the 1 ¼” range is one of the bestsellers of the hydraulic specialist UNIFLEX also in the ecoline variant, which is of almost identical construction as the SL 3-75. Like its mobile model, the SL 3-75 for industrial use also stands out thanks to its compact, space saving design, high user-friendliness and diversity as well as extremely long life. This unsurpassed benchmark for quality and economic efficiency is due to the proven, lubrication-free UNIFLEX slide bearing technology. The latter not only ensures low maintenance cost, but also considerably less crimp power loss and high stability as regards process and repeat accuracy. And since the hose assemblies produced with the hydraulic crimpers from UNIFLEX are not soiled with lubricating grease during the crimping process, they are also ideally suited for the food and pharmaceutical industry. The technical data of the SL 3-75 show how versatile the application range of this hydraulic crimper is. With a force of 50 t (500 KN), the machine can crimp hoses with diameters from DN 4 to DN 75 mm. Thanks to the big opening path of the jaws of 55 mm, it is also easy to crimp fittings with a flange – without removing the crimping dies. A machine opening with a diameter of 125 mm without crimping dies and maximum pressing dimensions of up to 88 mm also enables to process larger workpieces, for instance, in the production of fire hoses.